Generally, by adopting the thermal physical method to conduct dehumidification, we call this process as “dry”. It is characterized by using heating, cooling, decompression or other energy transfer methods to make the wet parts of the materials produced phase change process such as evaporation, condensation and sublimation as well as material separation in order to achieve dehumidification purposes. The drying machines widely used in industry includes: chamber dryer, tunnel dryer machine, vacuum drying machine, belt dryer, spray dryer, flash dryer, air stream dryer, continuous plate dryer, fluid bed dryer machine and drum dryer. In addition, there are special drying technologies and drying equipment in fruit, vegetable, grain, wood, tea, dairy product, Chinese medicinal material and other industries. These drying technologies have been developed for a long time and become mature and reliable. They have been widely used all over the world. Drying technology has wide application areas. Facing numerous industries, various physical and chemical properties of materials, product quality and different requirements, the drying technology has been developed into a multi-industry and interdisciplinary technology with experimental and scientific natural. Generally, the development and application of drying technology should have three aspects of knowledge and techniques. The first is to know the physical and chemical properties of drying materials and the using characteristics of the drying machine. The second is to be familiar with the transfer principles, namely mass transfer, heat transfer, fluid mechanics, aerodynamics and other energy transfer principles. The third is to have implementary means, which can carry out the engineering design of the drying process, main drying equipment and electric instrument control. 1.According to the operating pressure, it can be divided into normal pressure drying machine and vacuum dryer. The normal one can take one or several forms to conduct heat transfer at the same time. While the conduction heat transfer and radiative transfer are in the majority in vacuum drying. The vacuum drying machine is mainly used to deal with heat sensitive materials and the materials with solvent recovery. 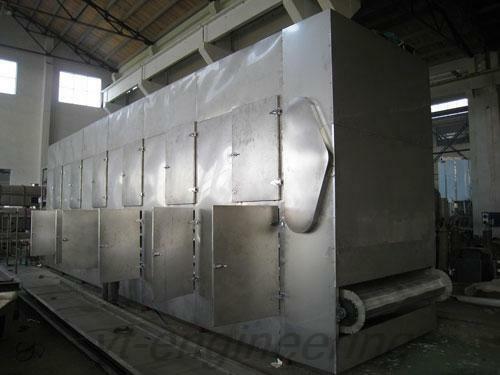 2.The drying equipment can be split into batch type dryer and continuous dryer on the basis of operation modes. 3.The ordinary states of the dried materials can be divided into blocks, flake, granular, powder, fibrous and pulpiness. In many cases, the initial conditions of the materials decide the form of drying machine. 4.According to the heat transfer, the drying equipment can be divided into convective heat transfer, conduction heat transfer dryer and radiative transfer dryer.